Something much subtler than ECT could be the new way to treat mental illness. Flavio Frohlich demonstrates transcranial current stimulation and electroencephalography with graduate student Kristin Sellers, assisted by graduate student Michael Boyle. All the time. Your brain continuously takes in messages from your auditory system—a cascade of data that, if you paid attention to all of it, would drown out your thoughts in a cacophony of sound. If it weren’t for your prefrontal cortex, you might think that the sound of running water was a human whisper, or that the wind contained a secret message. But the decision-making part of your brain sorts out this onslaught of auditory information, so that you know when you’re hearing a baby’s cry, or a dog’s bark, or nothing at all. In short, if your prefrontal cortex didn’t work so well, you’d have auditory hallucinations—much like the effects of schizophrenia. In fact, even a healthy person can occasionally hallucinate sounds, says UNC neuroscientist Flavio Frohlich. It’s just a glitch in the electrical firing of neurons between your auditory and prefrontal cortices. In schizophrenia, that glitch becomes a pattern. And Frohlich thinks he can change the pattern—painlessly, without drugs or side effects—by manipulating the brain’s electric field. Five years ago, this would have sounded like junk science. But it’s real, and there’s good reason to think that someday soon, psychiatrists will prescribe low-grade electric stimulation alongside drugs and talk therapy. First, let’s clarify—this isn’t electroconvulsive therapy, or ECT. Since before psychiatric drugs were invented, doctors have been using ECT to treat depression. Neurons, the cells that make up the brain, communicate with each other in faint electric pulses. A sudden, intense pulse of electricity to the brain causes billions of neurons to activate all at once. When they quiet down, they seem to “reset” to a less depressed pattern. But the treatment causes serious memory problems and requires the patient to go under anesthesia. Enter the electrical engineer. Frohlich, who spent his undergraduate years learning how to manipulate complex electrical systems, is far too precise to ever turn a powerful, unfocused electric current on the brain. Instead, he works with small, carefully targeted electrical pulses, only a tiny fraction of the strength of the current used in ECT. Administered through wet sponges sitting on the patient’s head, transcranial direct-current stimulation (TDCS) is usually painless. Many people can’t even feel it. Some experience a little itching or—especially if they’re bald—some redness on the scalp that fades quickly. The current is so subtle that it doesn’t completely take over what neurons are doing. It just changes when, exactly, they fire. Up until a few years ago, scientists thought that the brain’s electric field was a byproduct, an echo, of the tiny electric pulses passing between neurons in your brain. But then a few researchers, Frohlich among them, demonstrated that the field helps regulate neural activity and synchronize neurons. That is, the electric field around the brain helps neurons talk to each other. This got Frohlich excited, because it meant that if he could change the field, he might be able to change what goes on in the brain. Other researchers leapt into action too. 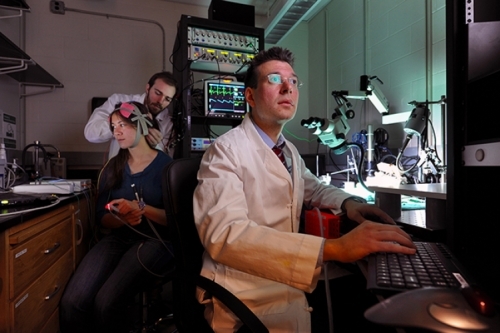 TDCS requires only some very basic electrical equipment, so labs around the world quickly began studies to stimulate people’s brains in a new way. What did they find TDCS could do? One unusually well-designed study, he says, was from the University of Lyon in France, in which 30 people with schizophrenia reported that after TDCS, they heard voices about 30 percent less than before. The researchers followed up with the patients, and the treatment was still working, even after three months. Frohlich decided that the schizophrenia study was so potentially life-changing for patients that it had to be replicated—and improved upon—as quickly as possible. According to the National Institutes of Health, about 1 percent of Americans have schizophrenia, many of them too sick to work or even talk lucidly with their doctors about treatment. Antipsychotic medication helps some, but has serious side effects. A 2013 study estimated that the costs of schizophrenia—from treatment to caregiving and unemployment—are about $4 billion a year in the United States. In schizophrenia, Frohlich says, “a lot of things are a little bit wrong. Different factors and genes and molecules all come together in some very complicated way that gives the patient a disease. So the disease is incredibly hard to define, let alone to know how to treat. Schizophrenia researchers know that in the disease, the auditory cortex and prefrontal cortex aren’t in sync. Neurons in the auditory cortex don’t send the right electrical signals. The University of Lyon study used TDCS to stimulate both of these areas with a low, steady current. Frohlich thinks that by turning the current on and off in a pattern that mimics the natural oscillation of neural activity in the brain, he can more effectively bring these two brain areas in sync with each other. The TDCS equipment is very portable, Frohlich says, so his team is treating patients not just UNC Hopsitals and other large medical centers, but also in rural parts of North Carolina where people often don’t have access to clinical trials and new treatments. When they get to 20 patients, they’ll have enough data to say whether it seems to work. Electrical stimulation probably won’t replace antipsychotic drugs, Frohlich says, but it can be tailored more precisely to the patient’s needs than drugs can. “With a drug, there aren’t many parameters you can change,” he says. “You can take more, you can take less—that’s it. With brain stimulation, you can change which part of the brain you stimulate, but you can also change the stimulation itself. You can make it constant, or brief little pulses, or essentially an infinite number of patterns.” Drugs might someday be used with brain stimulation, Frohlich says, to prolong TDCS’s effects. What will come next, after he’s helped improve schizophrenia treatment? “Preventing schizophrenia,” Frohlich answers immediately. UNC psychiatrist John Gilmore, one of Frohlich’s collaborators, has done some of the leading research showing differences in brain structures, starting from infancy, in people who go on to develop schizophrenia. This means that years before symptoms start, the prefrontal and auditory cortices are already miswired. Frohlich believes that in the earliest years of life, while the brain is still highly malleable, neurons could be taught to communicate in normal electrical patterns that will persist into adulthood. Flavio Frohlich is an assistant professor in the psychiatry and cell biology and physiology departments in the UNC School of Medicine. His work is funded by the Department of Psychiatry, the National Institute of Mental Health, the Foundation of Hope for Research and Treatment of Mental Illness, the Brain and Behavior Research Foundation, the Human Frontiers Science Program, and a UNC School of Medicine Translational Team Science Award. Frohlich also just won an award from the Brain and Behavior Research Foundation to investigate the potential of transcranial alternating-current stimulation to treat major depression. Frohlich’s schizophrenia trial is performed in close collaboration with Professor of Psychiatry Fred Jarskog and John Gilmore, the Thad and Alice Eure Distinguished Professor of Psychiatry, both in the UNC School of Medicine. The first study of transcranial direct-current stimulation and auditory hallucinations in schizophrenia was led by Jerome Brunelin at the University of Lyon.